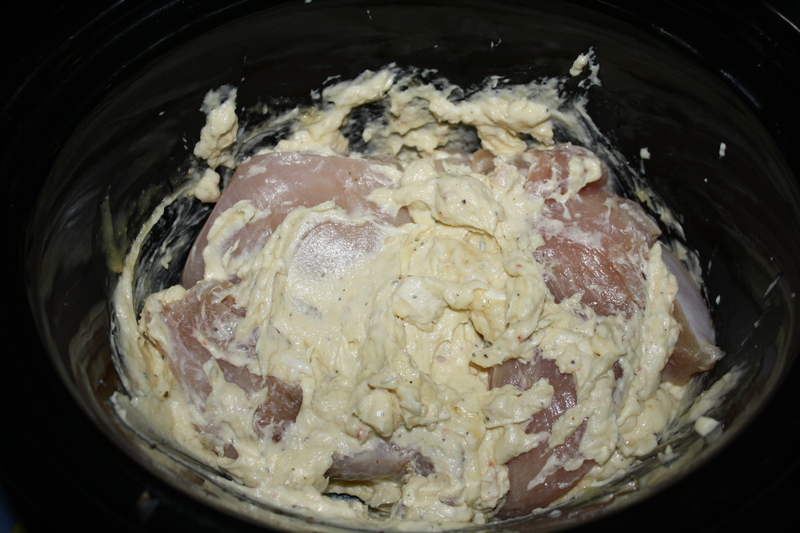 stir the cream cheese, cream of chicken, and seasoning together in the crockpot. i actually start it on low and let them sit in there for about 30 min so the cream cheese is softer to stir. put the frozen (because i’m lazy) chicken in and cover with the mix. cook on high 4-6 hours or until the chicken is cooked and fall-apart-tender. after the first two hours when the chicken is softer i cut it up into strips for easier eating. how easy is that!? 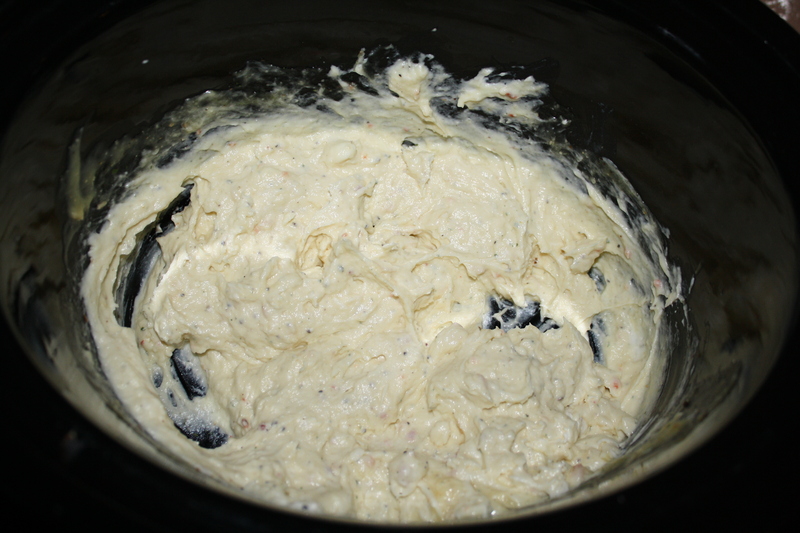 I set the cream cheese out for about half an hour as the recipe called for, and then put it into the crock pot with the cream of chicken and Good Seasons packet. Right off the bat, I had some reservations. I don’t really like to cook with canned soup, but once in a while, you get lazy and just go with it. It was impossible to find cream of chicken at my local market that was made by any company other that Campbell’s, so I chose the low-sodium (Healthy Requests) option. 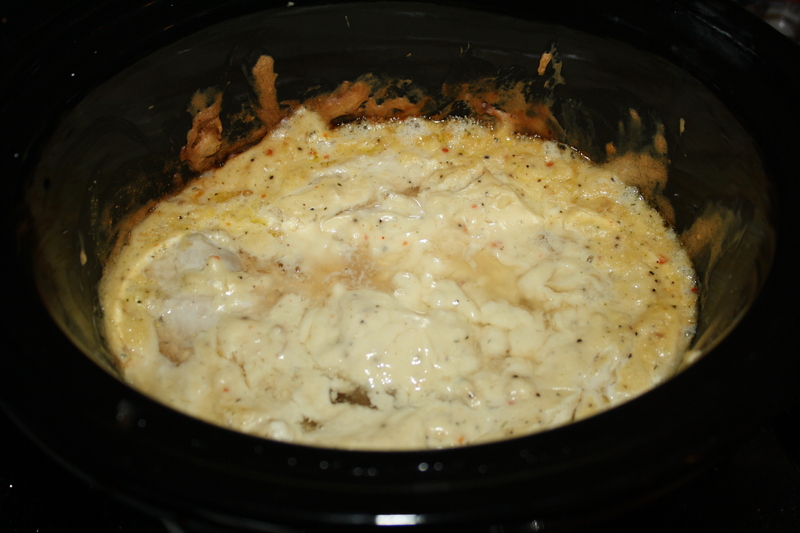 Also, I’ve worked with cream of chicken before, and had concerns was that the dish was going to end up a little bland, but I figured that the cream cheese and Italian seasoning might even that out with a little tang. The concoction, at first, seemed reluctant to melt, but after about 20 minutes, I put in the chicken. 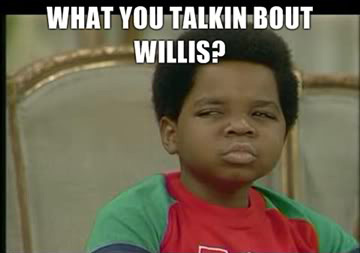 I did not use frozen chicken as the recipe called for because the chicken I had was already thawed. But you also need to watch with putting frozen chicken in your crock pot because you may risk cracking the thing as thoroughly frozen meets the heated ceramic. Also, if you start with frozen chicken, your dish will take that much longer to cook. After 20 minutes, I got tired of waiting for the cheesy soup goop to liquify, and just threw in the bird. I used three breasts, about 2.5 lbs in all. The recipe says that you can shred the chicken after about two hours, but I found that the meat was still too raw and tough for that. My chicken wasn’t ready to be shred until about five hours in the pot. But here was where I encountered a problem. After about four hours on low, the cheese started to burn and stick to the sides of the pot. It was starting to look like a take-out pizza kind of night. After the shredding, I gave it a taste, and it was a little bland, so I added some black pepper. No salt was necessary because Campbell’s takes care of that in spades. It wouldn’t be a bad idea here to add a little garlic powder either. It might spruce up the flavor some. Because of the burning cheese, at this point, I turned the crock pot setting from “Low” to “Keep Warm” until it was time to serve. For a family of five, I served this over rice, using about one cup of uncooked Uncle Ben’s. 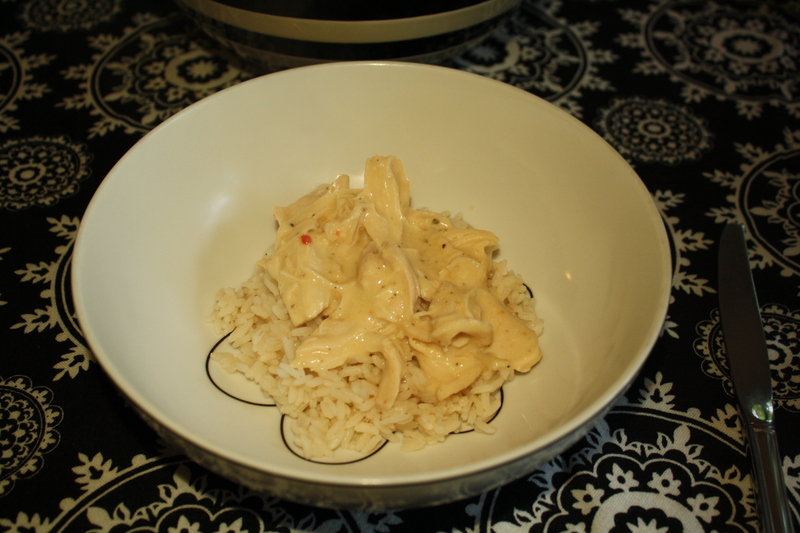 My husband, Manfrengensen wasn’t too keen on having a creamy chicken dish two nights in a row, but he said it was good. It tastes a bit like chicken pot pie, without the veggies. I wished that I had thought to throw in some carrots, celery, et al. at the beginning of the process. The end result would had been tastier and slightly healthier. 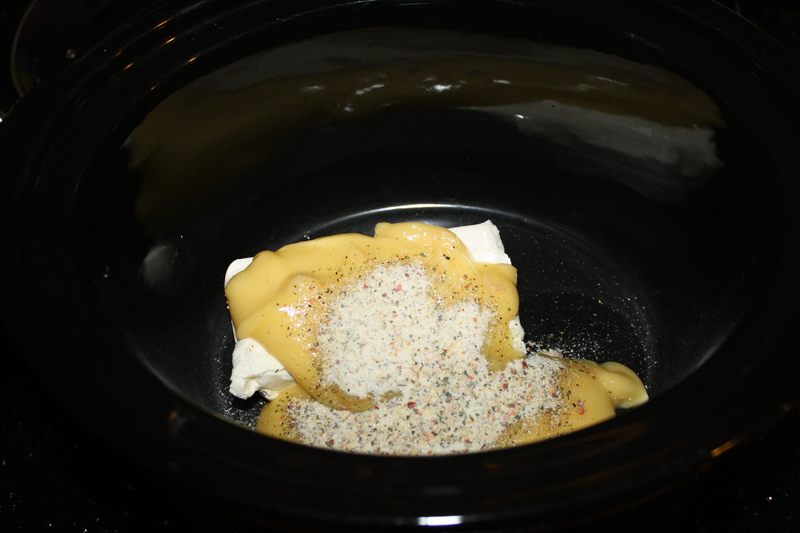 Overall, this was an easy chicken dish, until it came time to clean the cheese-encrusted pot. Would I make it again? Maybe in winter, with the additions mentioned above. If you are going to make this again, maybe use one of those disposable crockpot liners that they sell in the grocery store. Then you won’t be scraping. Just throw it out! Also, I have never had problems using frozen chicken. 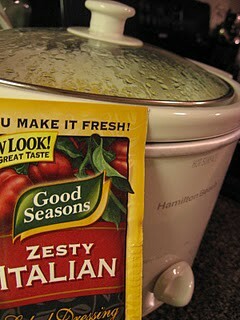 That said, I know that some crockpots run different and maybe mine just gets hot! I agree, a Crock Pot liner is the way to go with this one. I make this recipe a lot, but I vary the process a little bit. Put the chicken in with the seasonings and 2-3 tbs of butter and that’s it. 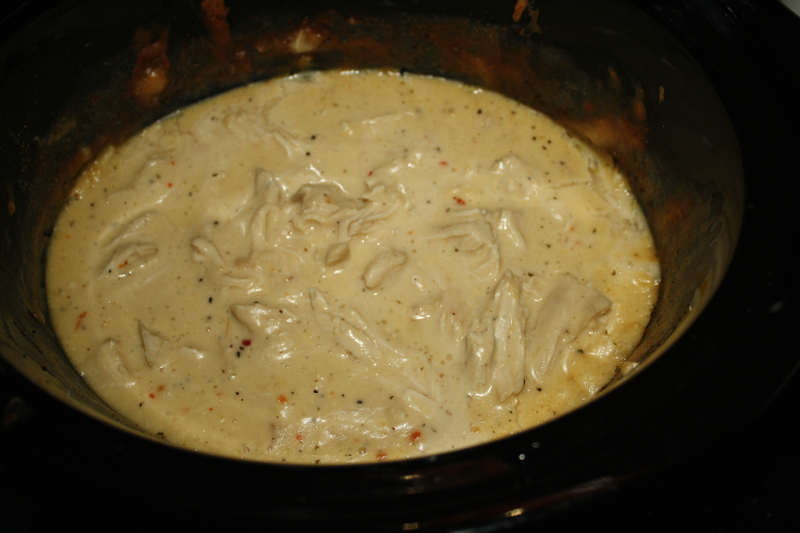 Cook on low for about 5 hours and then add the soup and cream cheese. Cook until warm and serve. This gives the chicken more flavor because the seanonings really get in there. Yum!